Semana Santa (Easter week) in Lorca is an extraordinary week, as although the religious acts follow the similar pattern of processions charting the last acts of drama in the life of Christ, as in other parts of Spain, the city stands out for its exceptional embroideries and the "biblical processions" in which they parade. 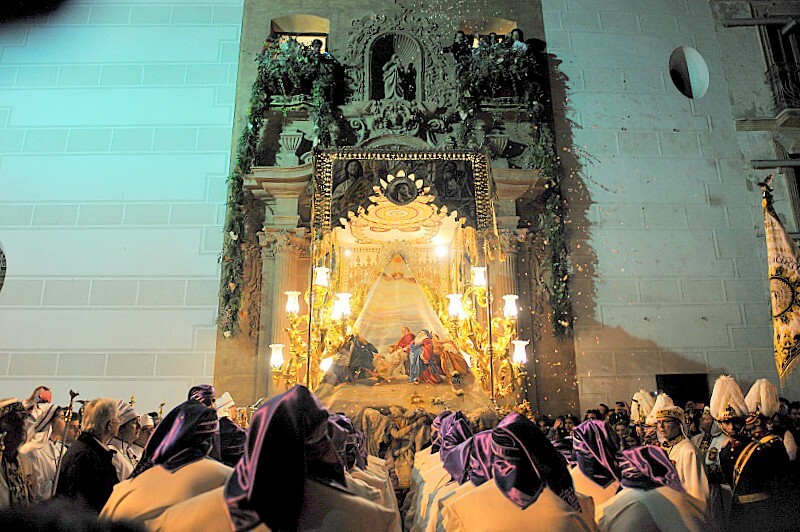 Although the brotherhoods of Lorca are documented as having carried out acts of penitence during Semana Santa since the 16th century, it was in 1855 that a group of 30 people from the Real e Ilustre Archicofradía de Ntra. Sra. 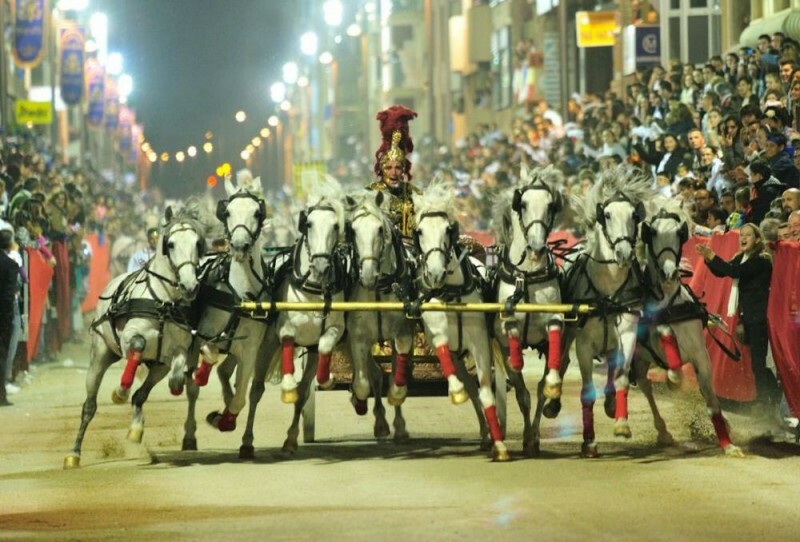 Del Rosario, Paso Blanco, changed the course of history in Lorca when they paraded during the Palm Sunday procession with a scenification of the “Pueblo Hebreo”, the Hebrews celebrating the triumphal entry of Jesus into Jerusalam. In 1856 a second group joined the procession as the “explorers” sent out by Moses, and in the same year horses featured in the procession for the first time, the numbers of participants gradually growing, along with the scenes represented, as gradually the cofradías began to create the stunning embroideries which characterize the week in Lorca and the biblical parades which are unique to the city. By the early 21st century a deep rivalry had sprung up between the Real e Ilustre Archicofradía de Nuestra Señora del Rosario, commonly known as the Paso Blanco (the whites) and the Hermandad de Labradores known as the Paso Azul (the Blues) to create increasingly splendid artworks, a rivalry which continues today as the two brotherhoods continue to expand their collections of stunning embroideries and present the spectacular "biblical processions" as part of the main parades of Semana Santa. 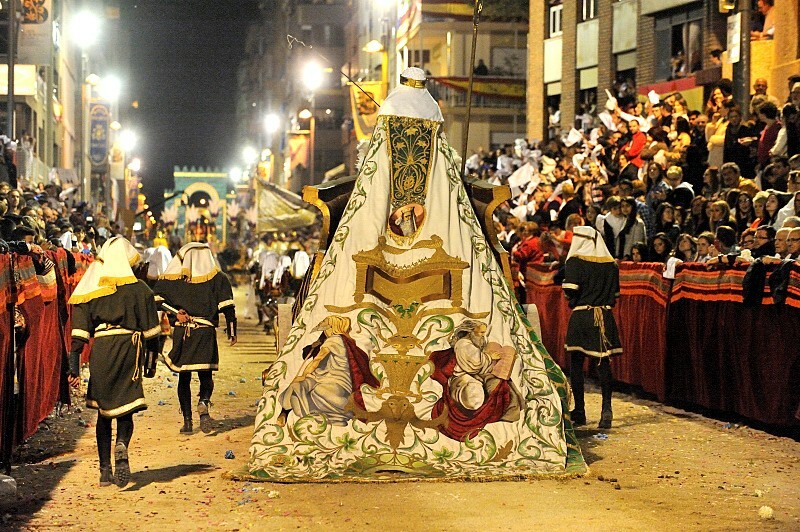 In 2007 the Semana Santa week in Lorca received official classification as an event of “international tourist interest” and in 2014 the tradition of embroidery in Lorca was officially “protected” by its classification of BIC status, or Bien de Interés Cultural. It is now an official candidate for declaration of Intangible Cultural Heritage of Humanity status by UNESCO. The Museo de Bordados del Paso Blanco, (MuBBla) contains some of the most important pieces belonging to the Real e Ilustre Archicofradía de Nuestra Señora del Rosario and showcases the incredibly elaborate embroidery which has been created to adorn their renowned Biblical Cortège, as well as other items which have been incorporated into the processions and which during Easter Week are paraded by horsemen, ornate carriages, Roman legions and a host of figures from the Old and New Testaments. 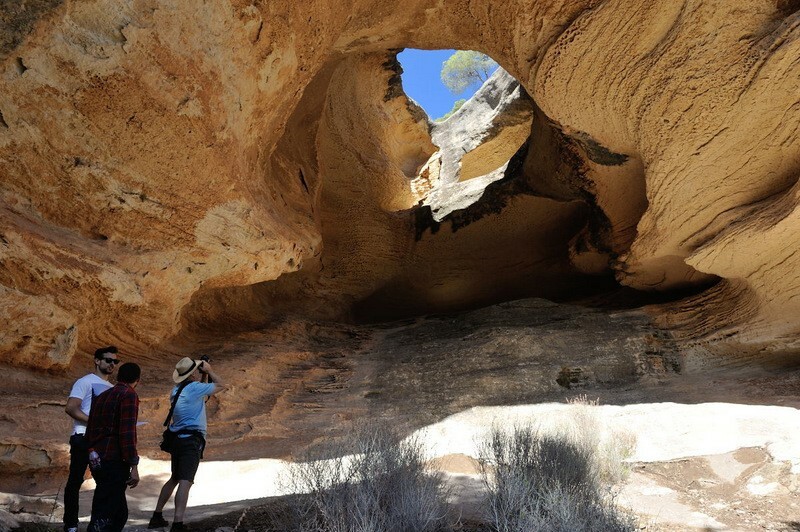 The Lorca biblical processions are the most flamboyant and ebullient expression of faith to be seen anywhere in the Region of Murcia and the MuBBla is one of the museums which offers visitors the chance to see these amazing artworks close-up all year round. 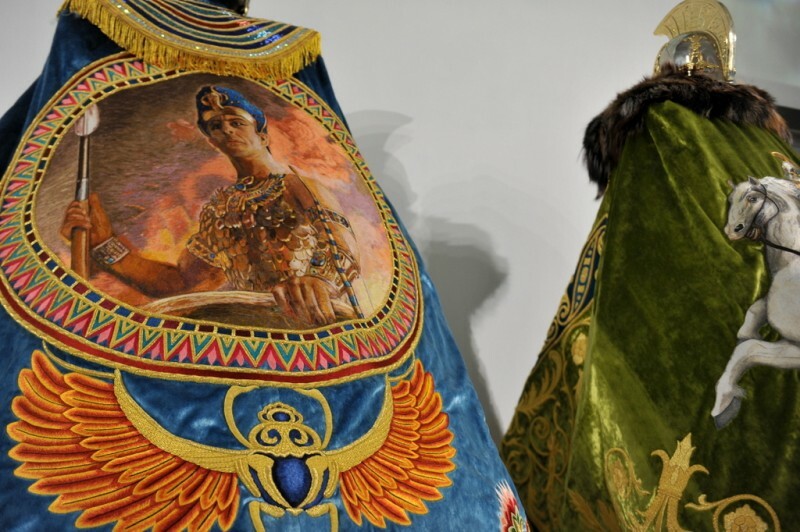 Although visitors who have never seen the parades in which the cloaks participate can appreciate the incredible amount of work and cost required to create them, those who have witnessed the parades will also find a visit to the museums an enjoyable experience, and a chance to appreciate the incredible detail and scale of every piece. Every stitch in the cloaks is made by hand and each cloak takes thousands of man hours to complete in the workrooms run by the brotherhood. Silks are specially dyed, and the gold thread used in the cloaks is pure gold, each piece costing thousands of euros of laborious work. 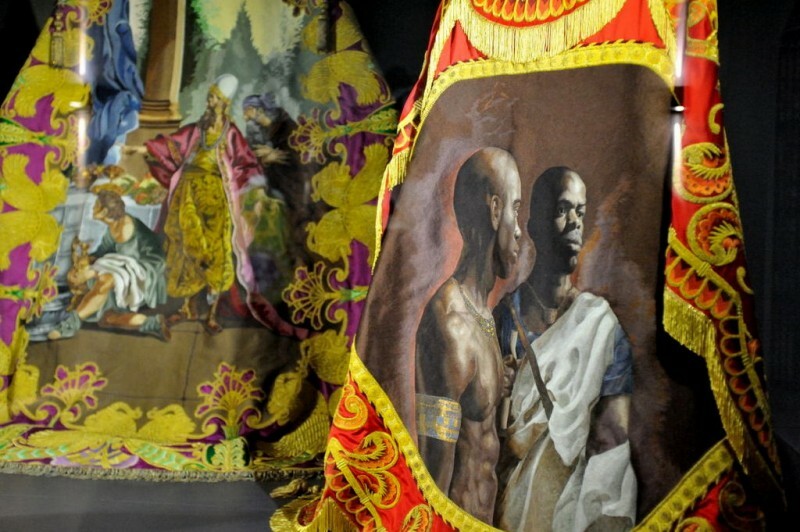 Some of the pieces have taken years to complete, and each year the skilled embroiderers must undertake an endless process of restoration and cleaning, repairing damage incurred during the processions and replacing worn sections of silk. 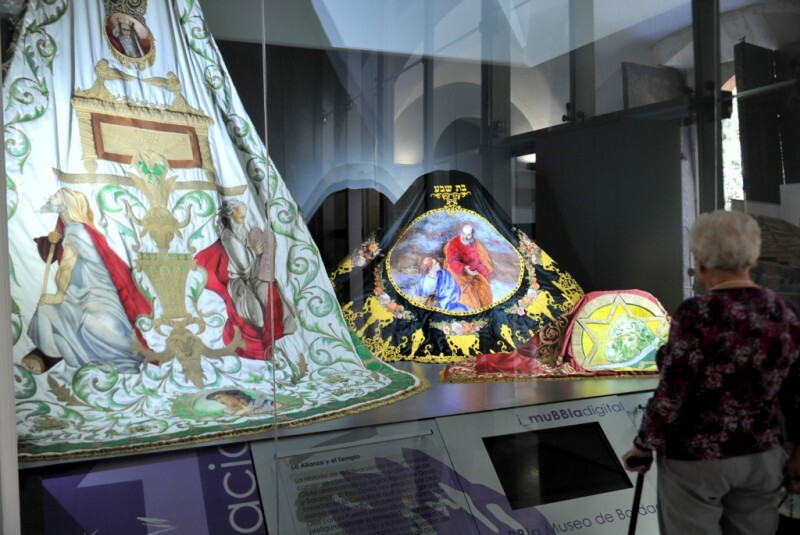 Every cent of the entry fees charged is re-invested into repairing exisiting cloaks, making new ones, maintaining the museum and the costs of the Semana Santa week. 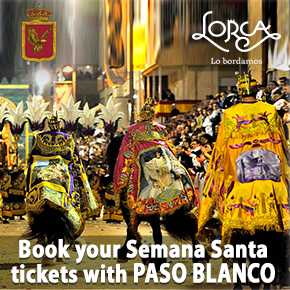 It is thought that the history of the Paso Blanco in Lorca may have its origins in the 15th century, although the first documented reference to the brotherhood states that it was formed in the year 1600 and dedicated to the Virgen del Rosario. In 1750 the word “Ilustre” (illustrious) was added to its name, and in the 19th century it received royal recognition from King Fernando VII: since then the official title has been the Muy Real e Ilustre Orden Archicofradía de Nuestra Señora del Rosario: no wonder locals still prefer to call it the Paso Blanco! 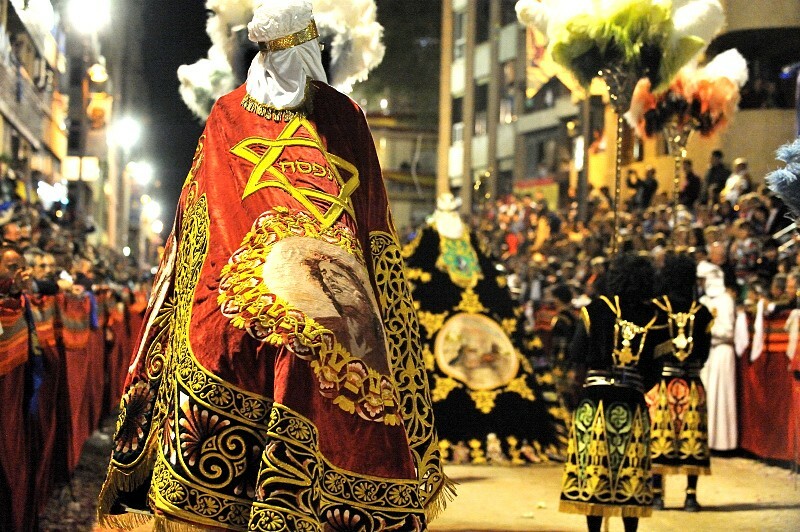 Among the tableaux which form part of the Whites’ biblical processions some of the most important and spectacular are the following. 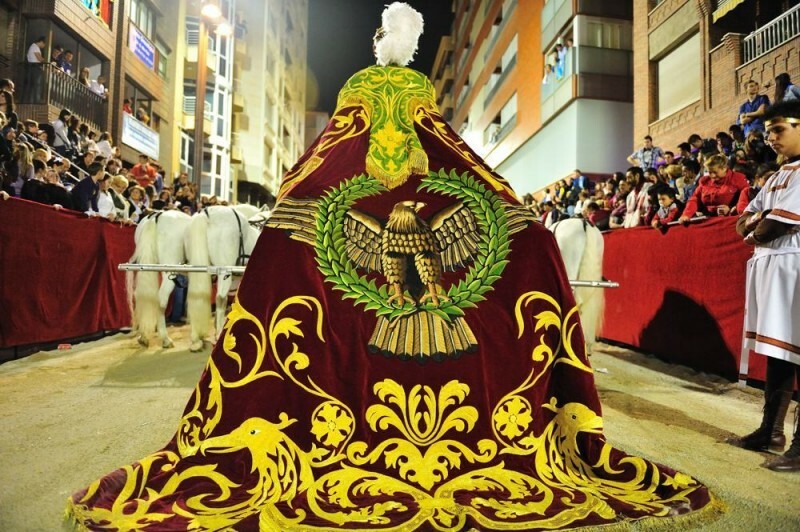 The Paso de Oficiales: members of the Paso Blanco already marched behind a coat of arms bearing the eagle of San Juan when in the 1750s a sculpture of the Virgen de la Amargura was commissioned from master sculptor Francisco Salzillo in Murcia. 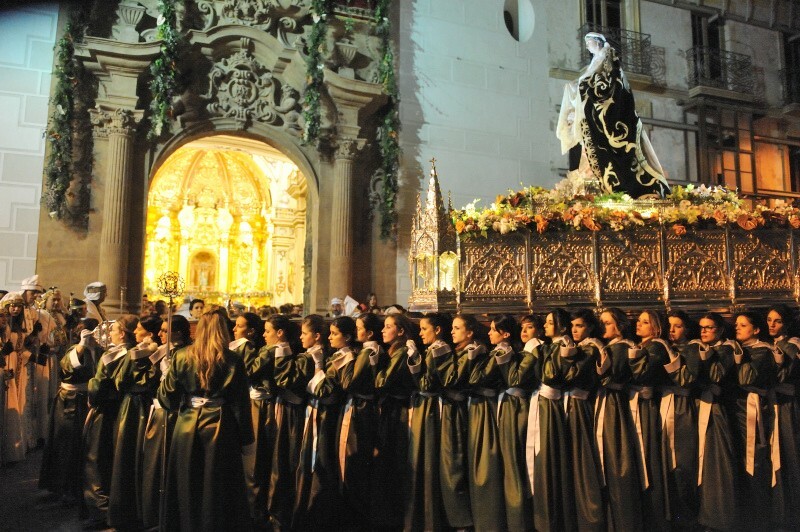 This figure was carried alongside that of the Virgen del Rosario well before the tunics of the Paso de Oficiales was changed from dark red to white. The Nazarenes: white is also the predominant colour in the clothing worn by this group, which was added to the procession in 1852. The entrance of Christ into Jerusalem: Added in 1855, this was the first item in the Biblical processions and features Jesus riding on a donkey, surrounded by the Hebrews carrying palm fronds and olive branches. The cavalry: it was in the early years of the 20th century that riders on horseback were added to the Paso Blanco. New sculpture of the Virgen de la Amargura: during the Spanish Civil War (1936-39) the figure created by Salzillo was destroyed, and a replacement was donated by a local family before the Paso Blanco finally opted for another statue created by Sánchez Lozano. This was part of a post-war restoration program which began in 1942. In 1995 the Museo de Bordados Paso Blanco (now the MuBBla) was created, and housed inside the Capilla del Rosario. 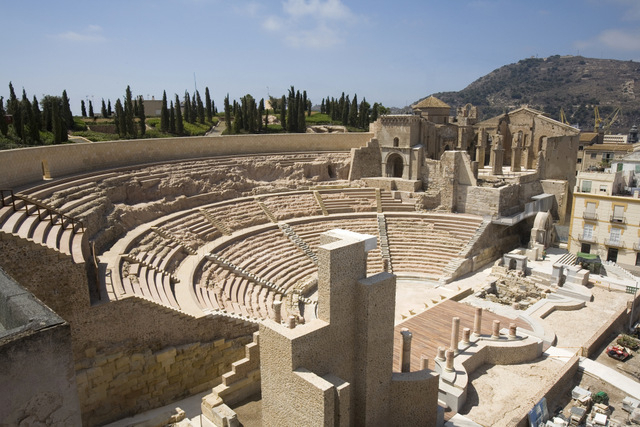 The Museo de Bordados del Paso Blanco is inside the church of the Monastery of Santo Domingo, which was founded by the Dominican Order during the prosperous boom years of the 16th century in Lorca in 1551, just 18 years after the beginning of work on the Excolegiata de San Patricio in the Plaza de España and ten years before the construction of the Iglesia de San Francisco. 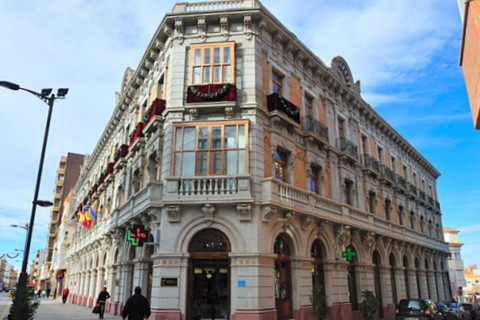 This is of particular importance to the Paso Blanco, as it means that the building is ten years older than the museum of their arch-rivals in the Paso Azul! However, work on the chapel as it is today did not start until 1707, and was continually delayed due to the inability of the brotherhood to keep up to date with payments. Thus the main doorway was not contracted out until 1740, the dome was painted by Baltasar Martínez Fernández de Espinosa in around 1743, the main altar screen was commissioned from José Ganga Ripoll in 1747 and it was not until 1766 that stonemason Ignacio Castell began work on the figures in the “camarín”, the small shrine set above and behind the High Altar. Inside the church of Santo Domingo visitors can see a sample of some of the finest embroideries belonging to the Paso Blanco, as well as a selection of other objects which are integral parts of the Semana Santa processions. The side chapels of the church contain embroideries from the processionary tableaux of King Solomon, the Jewish Cavalry, St John’s vision of the Archangel Saint Michael and the Devil, the Jews in exile, and many more. For many the highlights are the spectacular shrouds of the Anti-Christ and the Horsemen of the Apocalypse, and even those with scant knowledge of the Bible cannot fail to be impressed by the drama and vivid colours of these peices, which are so detailed that they are often mistaken for painted images. The first group tells the story of Queen Esther and her husband Ahasuerus, who ordered the extermination of the Jews before Esther rebelled against him to save her people. 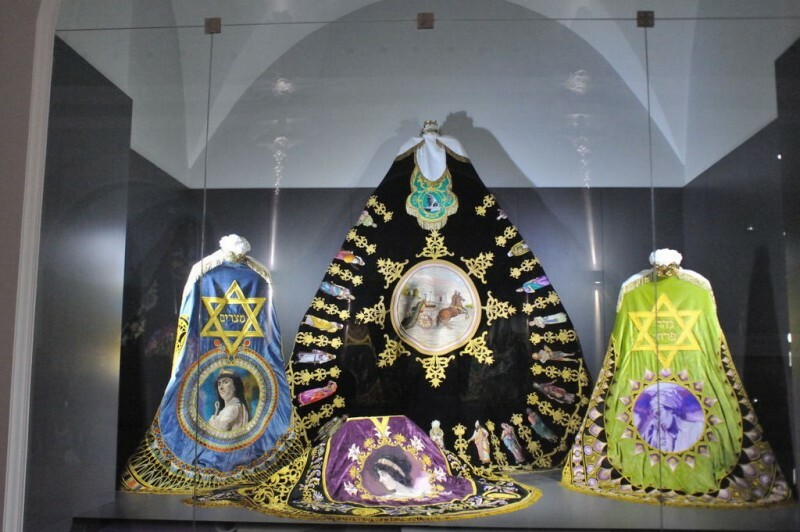 The items on display include the shawls known as ''La Reina Esther ante Asuero'' (Queen Esther appears before Ahasuerus), ''La Reina Esther en el Baño” (Queen Esther in the bath), ''El desmayo de Esther'' (the fainting of Esther), ''Esther dando limosna'' (Esther gives alms) and ''Dos eunucos'' (Two eunuchs). The second group concerns the apocalyptic visions of Saint John, and includes the Great Cloak and those of the Four Horsemen of the Apocalypse (Pestilence, War, Famine and Death). The forces of Good are represented by a figure symbolizing the Archangel Saint Michael, who wears armour of bronze, chrome and gold. 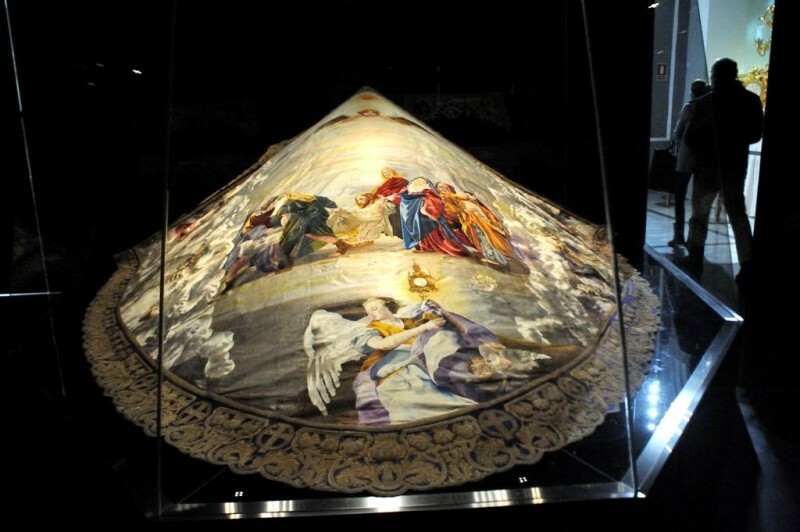 The largest of all of the embroidery works owned by the Paso Blanco is the cloak of the Anti-Christ, which shows a temple consumed by flames in the centre of a black background. The third group deals with the various tableaux related to the struggle between the Romans and the Christians, and includes the shawls of the Emperors Julian, Maximinus II and Galerius. The latter garment is popularly known as “La Loba” (the she-wolf) and shows the wolf suckling Romulus and Remus, the founders of Rome, on the banks of the Tiber. Visitors then see a fourth group, which includes the shawl of King David and those of his wives: David is shown as both a boy carrying the sword of Goliath and an old man on the same shawl. Another exhibit in this section is a small cape worn by one of the Ethiopian slaves gifted to King Solomon by the Queen of Sheba, showing an extraordinarily realistic portrait of an African face. 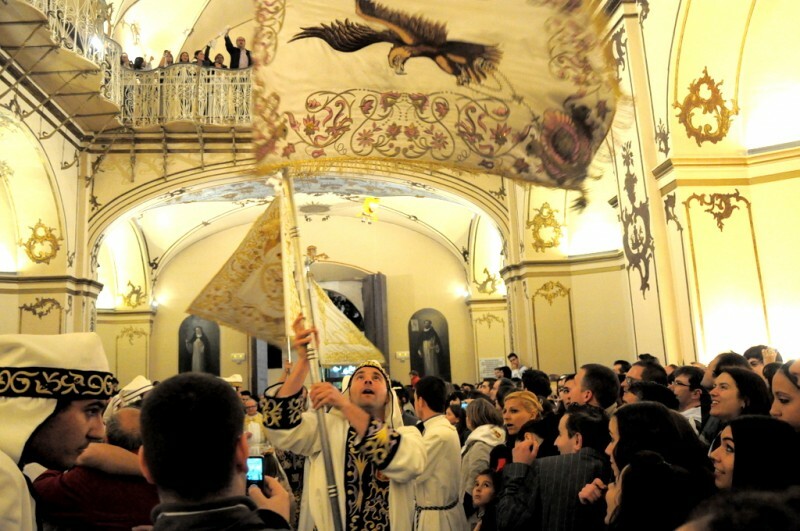 The fifth group of exhibits includes the shawl of the Roman Emperor Maxentius, who fought against Constantine to topple Christianity and is represented by the Roman Imperial Eagle. Visitors then proceed to the Capilla del Rosario, where the statue of the Virgen de la Amargura (1949) can be seen, as well as the figure of San Juan Evangelista, La Verónica and others. The museum is open every day of the week from 10.30 to 14.00, and during the afternoon from Monday to Saturday between 17.30 and 20.00. On Sundays the MuBBla opens only in the morning. 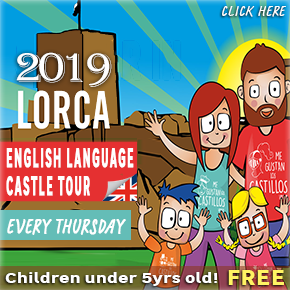 Explanatory leaflets are available in both Spanish and English, and the information boards are in Spanish, English, French and German. 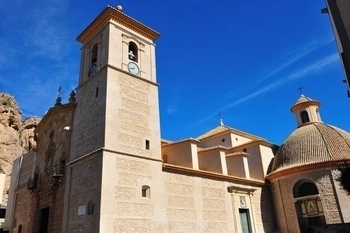 Guided visits can also be organized with prior warning, and include not only the museum but also the Capilla del Rosario chapel which is the religious home of the brotherhood, and which contains religious images and altar screens of incalculable artistic value. The MuBBla is fully accessible for visitors of reduced mobility, with lifts and widened doorways making it possible for wheelchairs to be brought inside. 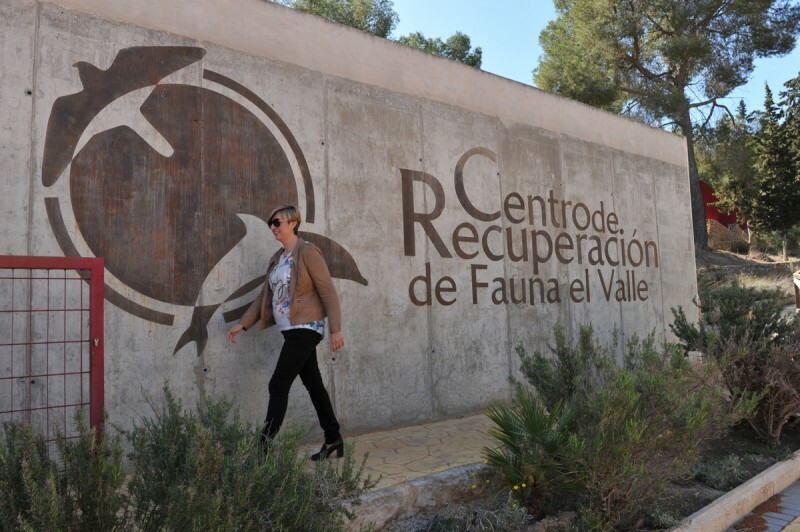 Parking: there is a public car park (San Vicente) 200 metres away from the MuBBLa, including two spaces reserved for those of limited mobility, while another specially reserved spot for the disabled is just outside the museum. It's easy to drop visitors off outside the museum and for the driver to park nearby. Tickets are sold by the brotherhoods directly via their web pages or directly from the offices and museums of the Cofradías. The seat prices vary according to the position within the stands and in the street, with the cheaper tickets being those closest to the entry and exit points of the processions and the higher-priced seats located in the centre of the stands. This is because the horses and carriages run set distances, so those seats in the middle have a better view of the more spectacular runs. 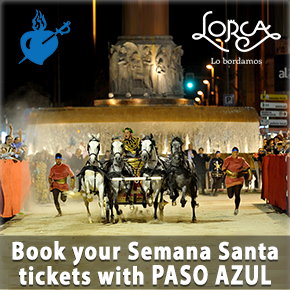 Click for the subject heading of Semana Santa Lorca to see the current ticketing information and further details about Semana Santa in Lorca. Be aware, seats purchased from the Paso Blanco are located in the midst of the supporters of "the whites", which can be a noisy and passionate experience, with cries of "Vive el paso blanco" ringing out throughout the procession. It really is an amazing experience! 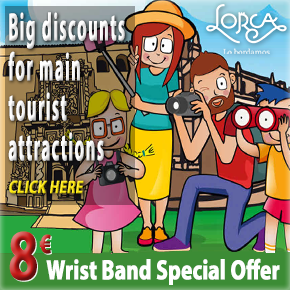 Those planning to visit several locations in Lorca are strongly advised to purchase a wristband (pulsera) from the Tourist Information Office, as it offers superb value, particularly for those able to spend time visiting all of the principal attractions. Priced at only 6.50 euros, it is valid for entrance to the La Merced visitors’ centre, Lorca castle and the four main Semana Santa and embroidery museums; the MuBBla belonging to the Paso Blanco, the Museum of the Paso Azul, the MuPaEn belonging to the Paso Encarnado and the Nicolás Salzillo “Il Maestro” museum of the Paso Morado. In addition, significant discounts are offered on the guided tour of the Jewish quarter and the synagogue in the castle and the wristband is valid for one entry to each, and without an expiry date, so visitors can return at their leisure to visit each of the attractions over a period of time. 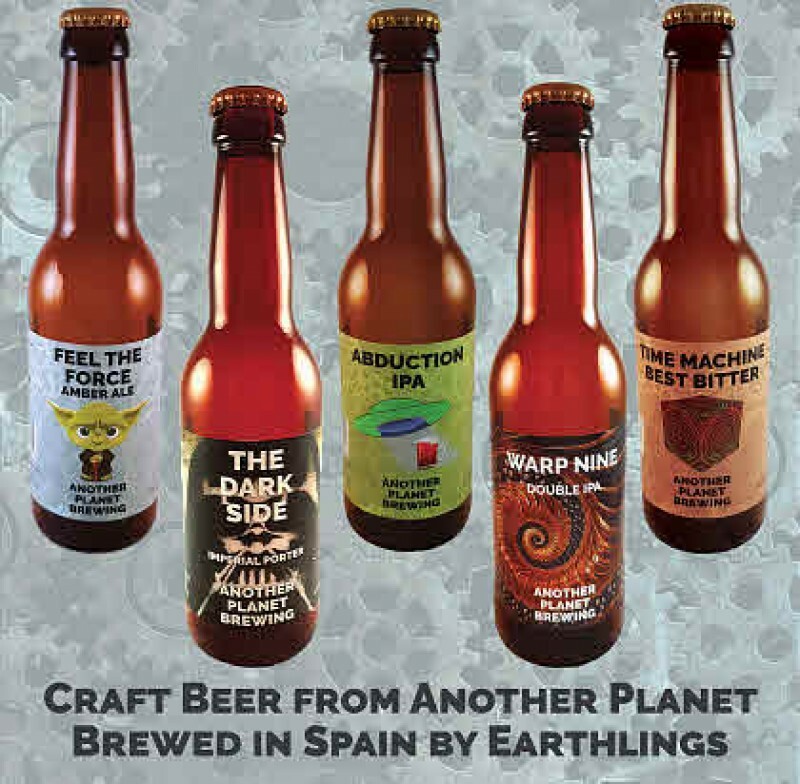 It's fantastic value! Click for full information about the wristband offer.